← If It’s Yellow, Let It Mellow Review – Does it Work? Using Butter Wrappers instead of Cooking Spray Review – Does it Work? Many domestic chefs, whether cooking or baking, often find themselves in need of a greased surface: a greased skillet for a quick veggie saute, a greased pan for baked goods that don’t stick, or even a greased measuring cup for easy release of sticky substances like honey. A convenient commercial solution to this is aerosol cooking spray. But could used butter wrappers be a green replacement to these expensive and environmentally unfriendly sprays? Better for you – aerosol cooking sprays can release toxic propellants that you don’t want to breathe. Also the safety of the “flavors” and oils used is uncertain. 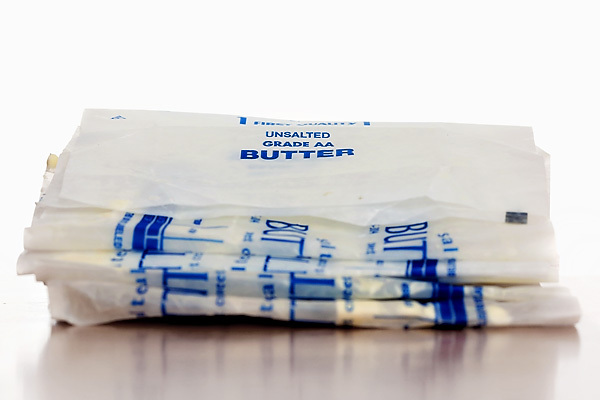 Saves money – If you already purchase butter in sticks, the wrappers are free! I really enjoy cooking and baking in the kitchen. For a long time I used aerosol cooking spray (like PAM) for all my greasing needs. It did the job, but I noticed it was kind of stinky, and gross – not something I would ever want to taste all by itself. You can get sprays that are flavored like butter, or olive oil, but what are those “flavors” actually made of? Eventually I decided that it just made more sense, and was healthier to actually use butter or olive oil as a greaser when needed. I ditched the aerosol, and started using a paper towel or napkin dipped in the grease of my choice. Sometimes it bothered me a little bit that I was throwing away a paper towel every time I greased something, but I couldn’t think of a better alternative. One day, as I browsed the crunchy mom blogs, I came across a great post about reusing old butter wrappers to grease cooking surfaces. Basically, you save the paper wrappers from sticks of butter for later use. You store them in the freezer and when you need a greased surface, you pull one out and put it to work. It sounded great to me, so I decided to try it out. Two weeks later, I remembered what a great idea it was, and decided for real this time to try it out (any other working moms as forgetful as me?). Whenever I used a stick of butter, I folded the wrapper in half and left it in the freezer. Honestly, it took a few more weeks to remember they were there to use them. Habits can be really hard to break! Once I started, using them was really easy! I found it worked best to hold the frozen wrapper between my palms for a few seconds to soften the butter. Then it works just the same as a napkin corner dipped in grease. All ready for round 2! Overall, this is a quick and easy way to reduce waste, and give a second life to the wrapper before throwing it away. My only trouble was getting in the habit of doing it, and forgetting to tell my husband about it for a while (he was throwing away the butter wrappers he found in the freezer because he didn’t know what they were there for). Have you ever tried this green idea? Do you have other ideas for quick and easy green replacements in the kitchen? This entry was posted in In the Kitchen, Real Food and tagged better for the earth, better for you, cooking, easy, real food, reduce, reuse, saves money. Bookmark the permalink. 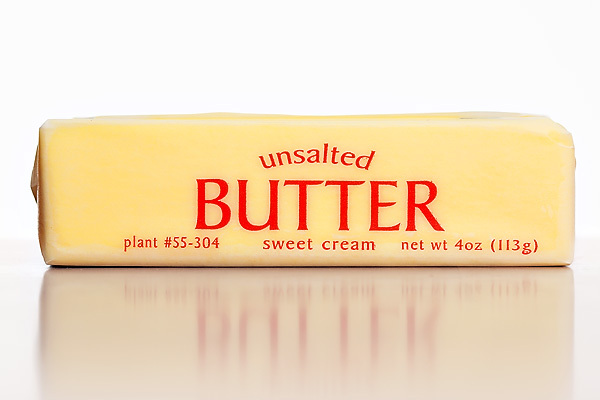 29 Responses to Using Butter Wrappers instead of Cooking Spray Review – Does it Work? Funny, I have done this since I was first married and still do! I store them in the butter cubby in my fridge and just use as needed. My mother (born in 1930) always used a little bit of waxed paper to apply a thin film of shortening to muffin tins, cake pans, and the like. It works beautifully, costs very little, and in my kitchen, is always handy by the stove. In addition, I’m told that waxed paper disintegrates in the landfill rather quickly; plus, plus, plus, plus! I tasted Pam once, and it had not just an unpleasant odor, but also a really foul flavor! To simplify using oils I choose at the stove, I purchased 2 spray bottles that have been specifically designed to work well with oils. I use one for canola and the other for olive oil. I like avoiding the cheap oils spiked with additives that are in products like Pam; win, win! On occasion, one pump sprayer tends to sputter a bit rather than spray fluidly, but soaking the spray head and tube for about 10 minutes in hot, soapy water easily alleviates this problem. You can find these specialized pump action bottles at Amazon.com, as well as most stores with kitchen goods departments, like Bed, Bath, and Beyond, JCPenney, and even at Walmart. I suggest the glass or plastic all-in-one-piece bottles, because I had one metal cylindrical sprayer with a plastic bottom and top that came apart and leaked! Such an unnecessary mess! I hope this helps y’all save some money all the while using better tasting oils than that commercial spray junk! We buy butter in whole pounds and put a chunk at a time in the butter dish. When taking the last chunk out of the wrapper, we scrape off the last bits with a knife–so I don’t think we’re wasting much! We are reducing packaging a little by having 1 wrapper per pound and 4 pounds per box, instead of 1 wrapper per 1/4 pound stick and 4 sticks per box. Nice to see this post. My grandmas both saved their butter wrappers to grease pans, so does my step-mom, and so do I. I wouldn’t dream of throwing them away until every little bit has been used. Isn’t it a great idea? I’m not sure why I hadn’t thought of it before. I love that your husband was pitching the wrappers from the freezer. That’s exactly what my husband would have done. haha! This is a great idea though, and since we all have wrappers, we might as well put them to use. Thanks so much for sharing with Hearth and Soul! I have been doing this for over 30 years (let’s pretend I started baking as a toddler). It is frugal, effective, and adds a lovely flavor to baked goods. I guess the good ideas never die! Thanks for reading Alea! Interesting idea – I’ll have to try this sometime. It sounds like a great idea UNLESS you unwrap the butter when it is cold and then there is no butter left on the wrapper. It’s true, Jessica. The closer to room temp your butter is when you remove the wrapper, the more butter will be left on the wrapper. I often use the butter wrapper to grease the pan when there’s butter in the recipe — but I’ve never thought of saving them. Awesome idea! My mother and grandmother always used to use butter wrappers to grease or line cake tins or cookie trays, before you could buy parchment paper. I had forgotten until this post reminded me, so I should get into the habit of saving them myself. They used to just put the wrapper back into the butter compartment of the fridge until they needed it. Thanks for an interesting post! I’ve never considered using the wrappers as a liner. Thanks for the tip, Liz! What a great idea, this is something I’d definitely do…but can’t for the life of me figure out why I haven’t already! That’s exactly how I feel Pat! I love doing this! We have a nice baggie in the freezer that the wrappers keep getting added into. The other thing we use to grease is a “Misto.” I usually fill it with olive oil and works just like the cooking sprays without the chemicals. It is air powered (you pump it up and then spray it). This works when we don’t have any wrappers left or don’t want butter in the finished product. What a great idea to keep them in a baggie — mine are floating around everywhere in the freezer and annoying my husband. Thanks for the tip! I do this, too! I keep them in the fridge, though, so they’re always ready to go (you don’t have to warm them between your hands that way). Funny, I have done this for many years. I do not even remember where I picked it up from or just figured it out by accident….probably watched my mother do it at some point. Although I have never saved the wrappers just use the one that I emptied for a recipe and tossed it afterward. Loved this post. This is an excellent, frugal idea! I always use butter to grease baking pans, and from now on I will save my butter wrappers to make it easier and more efficient. Thank you for sharing! It’s so obvious, and yet so genious, isn’t it? Thanks for stopping by! Those butter wrappers are good for other things too. I keep them in the butter dish on the fridge door folded up fairly small. It’s fall now, so I used them when collecting pine cones – your hands get VERY sticky from the resin, but rub a used butter paper on it, then wash your hand with water and it’s gone (or use a wipe if you are outside). Also, when you get paint on your hands, you don’t have to use that toxic turpentine; just use your butter papers and wash – it’s gone! And if your pet gets into something sticky, butter paper + soap. (I understand that turpentine will kill a cat.) To be sure, it doesn’t have to be butter, any fat will do – crisco, mayo whatever, but the portability of the used butter paper makes them my favorite!